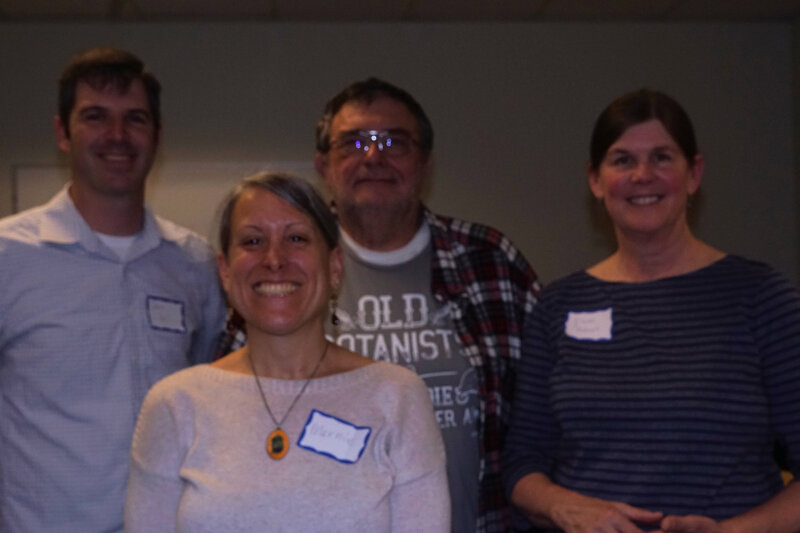 Bill's Botanical Forays | Focusing on the Patuxent Research Refuge Plant Inventory Project and urban botanical foraying. 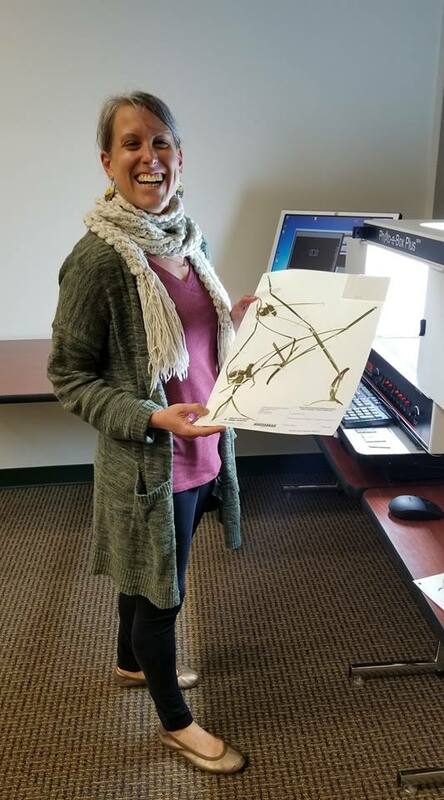 As the lead of the refuge plant inventory project, I would like to formally acknowledge the important contribution that Christine McElroy has made and is making with restoring voucher specimens in the Patuxent Research Refuge Herbarium. The positive impact of her work cannot be overstated. Christine has faithfully come to the North Tract Visitors Contact Station almost every Wednesday afternoon since 2017 to repair the specimens and the specimen sheets. 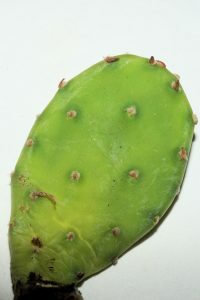 Some of the specimens have become loose and detached from their specimen sheets. 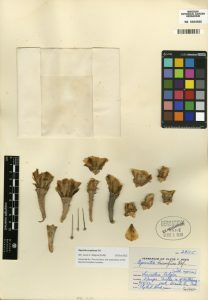 She has repaired hundreds of these specimens by re-attaching them more firmly to the specimen sheets. This will ensure that the specimens will remain intact for many years to come. She has also replaced several dozens of older specimen sheet labels which were starting to deteriorate because they are made of acidic non-archival paper. Replacing the labels is done by carefully taking off the old labels from the voucher sheets, photocopying the label’s images to acid-free archival paper, and attaching the new labels to the sheets. Since the new labels are photocopies of the originals, no pertinent collection information is lost. The old labels are filed separately so they are not lost. Replacing the older non-archival paper labels with newer acid-free archival paper labels will increase the durability of the labels. 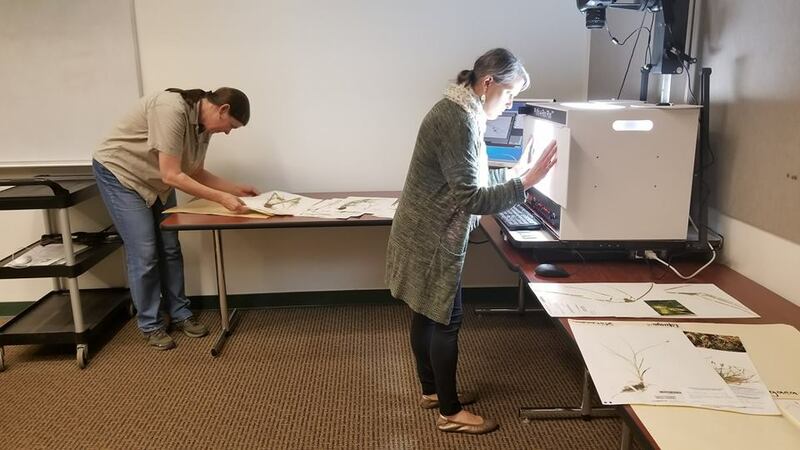 By repairing the specimens and replacing the labels, Christine is increasing the longevity of the specimens and is making the herbarium a more valuable resource for future researchers. Christine deserves the recognition for her fine work, attention to detail, and devotion to making a good herbarium even better. 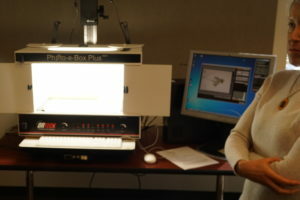 Lightbox used for imaging the specimens. 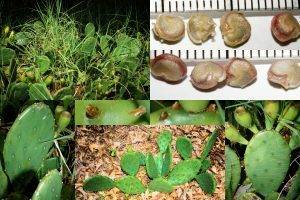 2018 was a banner year for the Patuxent Research Refuge (PRR) Plant Inventory Project (PIP) Team. The biggest event was the digital-imaging of about 4600 Refuge herbarium voucher sheets by the team. The PIP team appreciates Professor Maile Neel, Director of the Norton-Brown Herbarium, University of Maryland for her guidance and assistance in providing the equipment and space to image the voucher sheets and Dr. John Hall of the Mid-Atlantic Megalopolis Project (midatlanticherbaria.org) for his consultation with this part of the project. The PIP team also recognizes the Herbaria Consortium for providing the Internet portal, technical support, and computer resources to allow the images and accompanying data to be placed on the Internet. 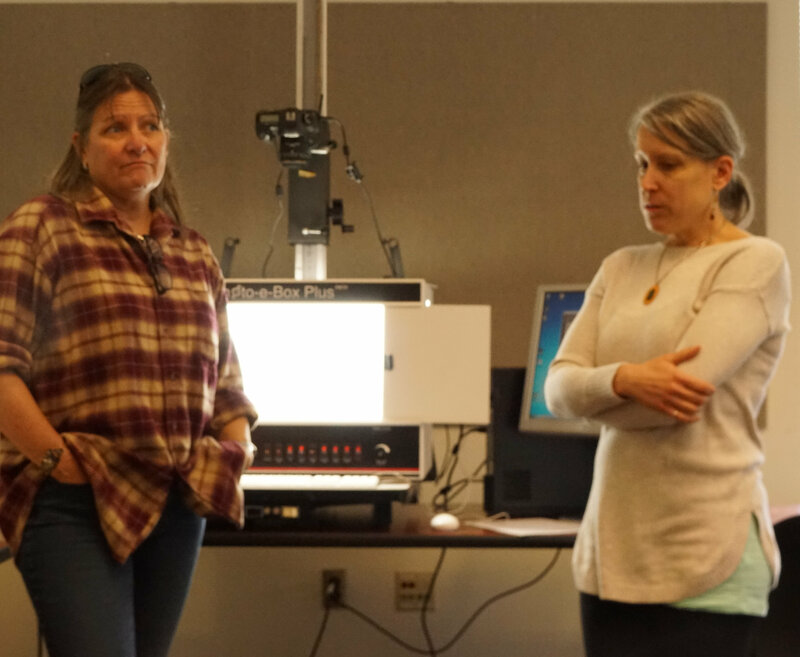 Marnie Whitlock and Elaine Nakash headed up this effort by spending several weekends and countless hours at the University of Maryland in College Park imaging the voucher specimens. 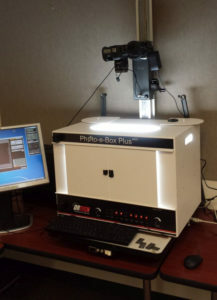 They used professional equipment (MK Digital Direct Photo-eBox PLUS) to digitally image the specimens and convert them into a format that made them ingestible to the Consortium database. After each session, Bill Harms uploaded the images to the Consortium database and matched them to the accompanying collection data already on—line in the PRR Herbarium’s portal. 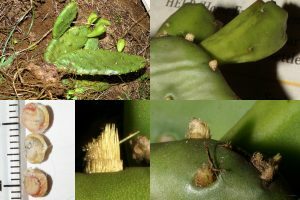 The images and the data are accessible online for researchers to view and study. Marnie holding a specimen for imaging. 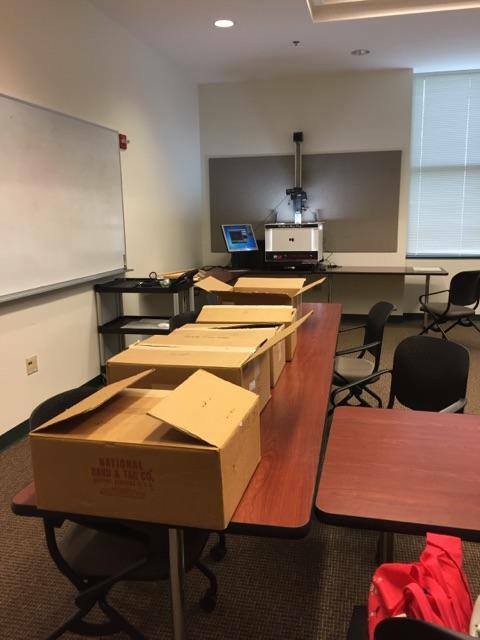 We used a barcode on each voucher sheet that corresponds with the specimens’ accession numbers to keep track of the sheets when we transported the between the Refuge and the University of Maryland. 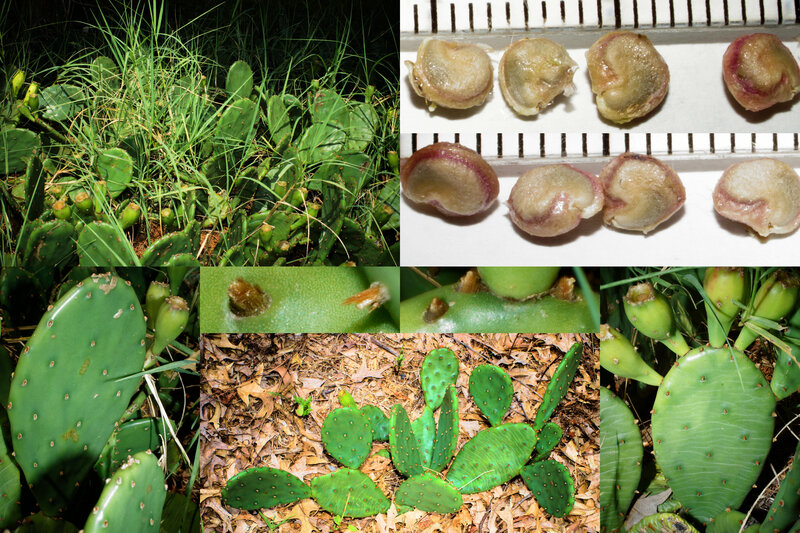 The project to image voucher specimens and make them available to the public on the internet is a joint effort of many educational institutions and governmental organizations throughout the USA and the world, and is funded in large part by the National Science Foundation. 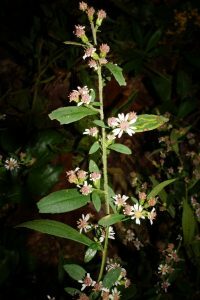 The Refuge Herbarium participates in this effort as a member of the North American Network of Small Herbaria (NANSH). The Refuge should be proud to be associated with this project. 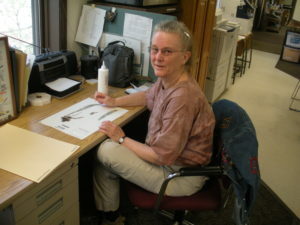 Since 2017, PIP team member Christine McElroy, has devoted her Wednesday afternoons to mounting specimens and restoring a countless number of voucher sheets that needed repair. 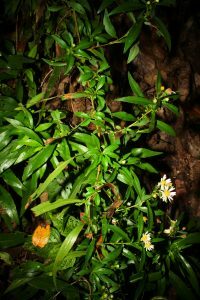 Through her efforts, the longevity of the specimens will be extended and the herbarium will be an even more valuable resource. 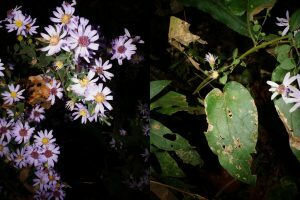 PIP team members collected an additional 200-plus specimens for the herbarium and added about 10 new species to the refuge list. Thank you to Dave Anderson and Matt Beziat for their assistance in this portion of the project. We are also excited to welcome a Lichen Survey Project led by Helga Matausch. The PIP Team participated in Refuge events at the Wildlife National Wildlife Center. Boxes of voucher sheet ready for imaging. Elaine and Marnie busy at work. Today I had my first encounter with Spanish Moss (Tillandsia usneoides). 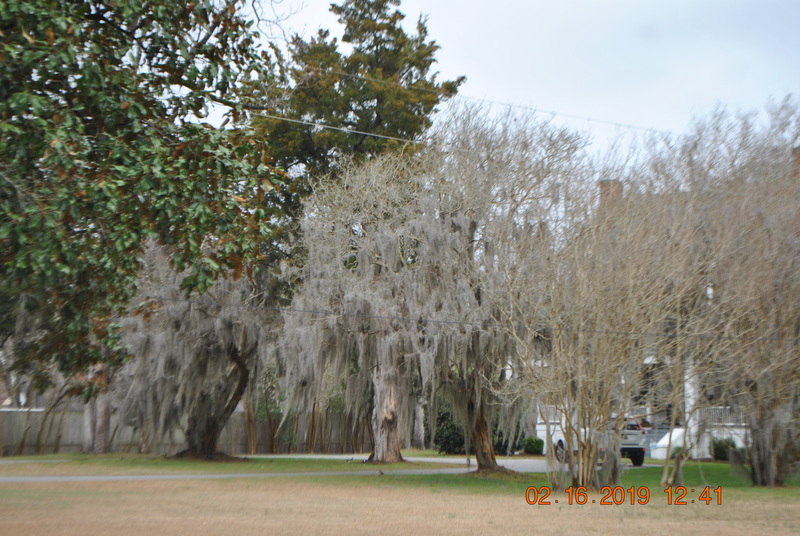 We saw it growing on trees throughout Florence, South Carolina. Spanish moss frequently grows on trees in tropical and subtropical regions. 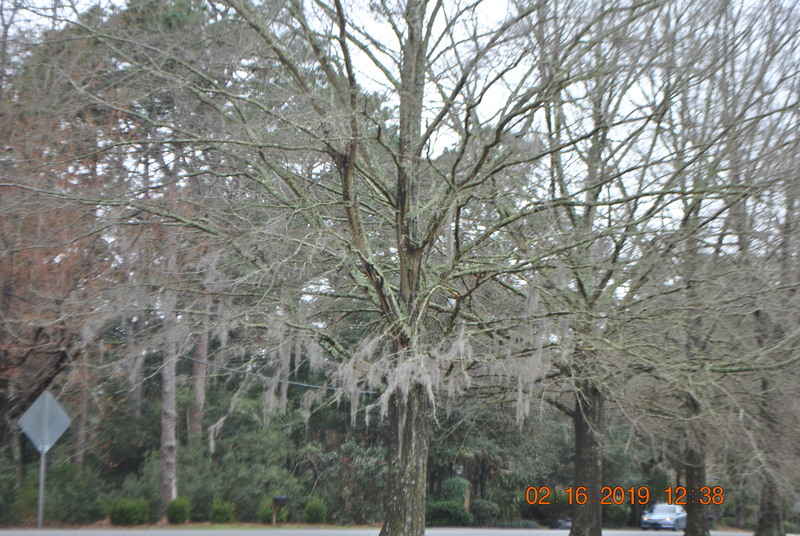 Around Florence at least, they seem to be partial to the Southern Live Oak (Quercus virginiana). 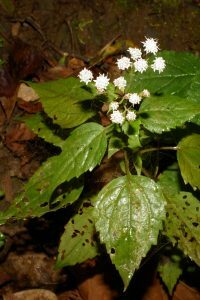 It is native to much of the Southern United States from Southeastern Virginia south to Florida and west to Arkansas and Texas. 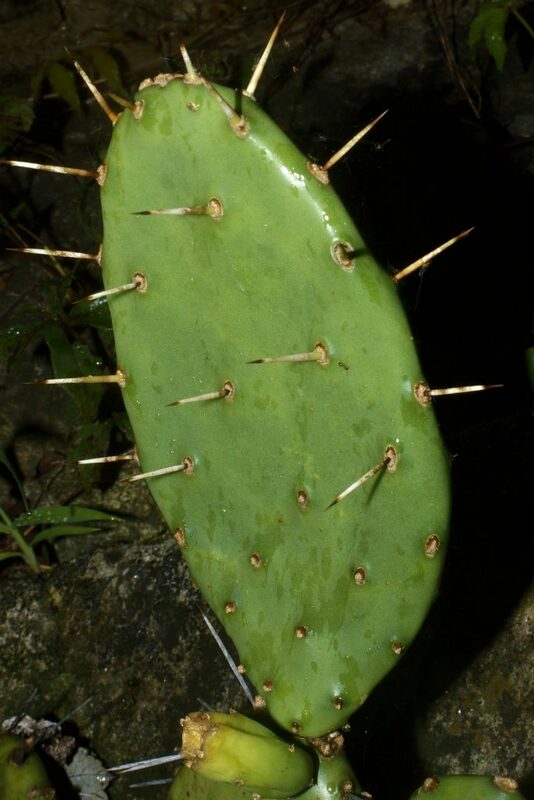 It also is native to Bermuda, Mexico, the Bahamas, South America, Central America, and the West Indies. 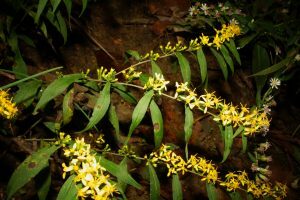 It has reportedly become naturalized to Queensland, Australia and French Polynesia. 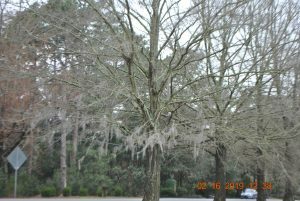 It is not a true moss but rather it is an epiphytic flowering plant. Here are a few pictures we took of it. Some trees were almost completely covered with it. 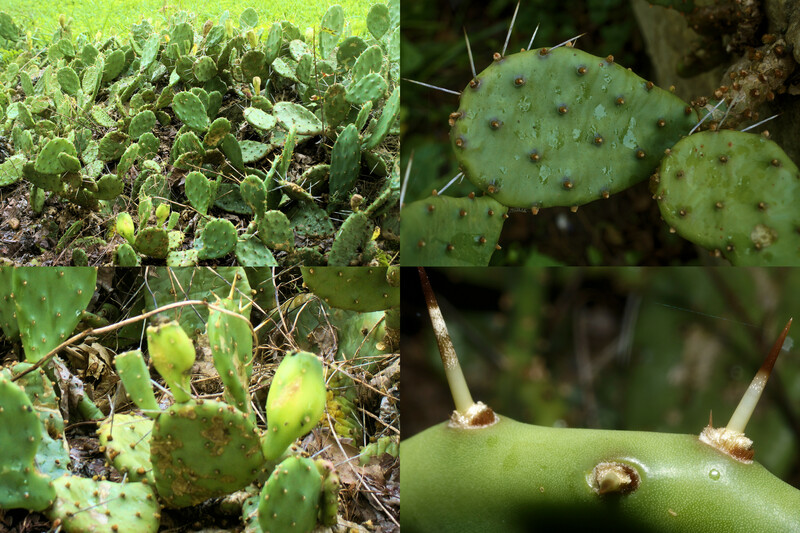 Today, Joe Metzger and I went on a foray to locate two populations of cactus in Washington County, Maryland. Along Kemps Mill Road, we spotted a limestone cliff face which could have been the “limestone ledges” referred to by Reed on the voucher label. 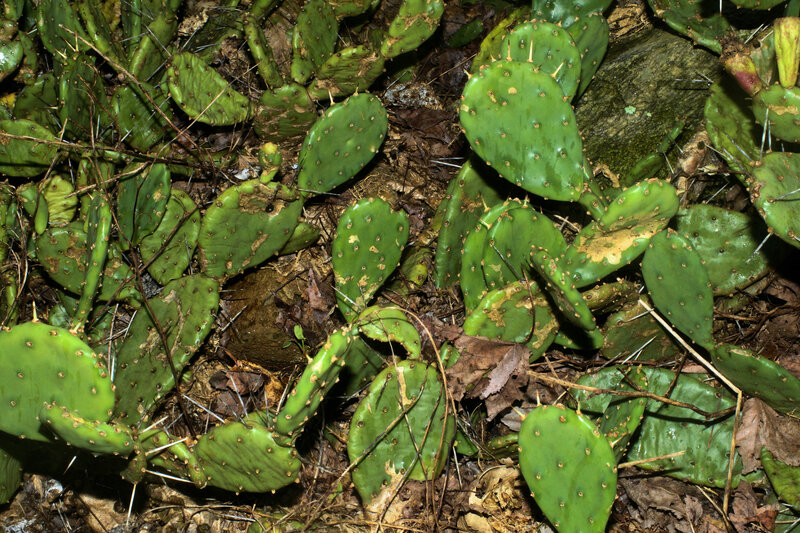 We make a cursory look at the cliff face and did not notice any spot that might have supported cactus. 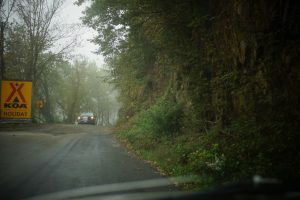 We could not see the upper parts of the cliff from the road. These areas are more sunny and might be a good place to look another time. The cliff face however sported a lot of interesting flora. 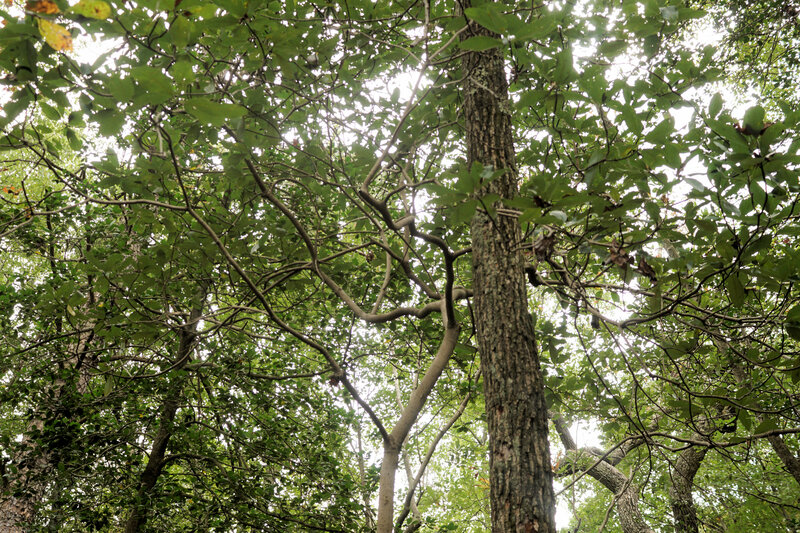 It was located near a KOA campground and faced mostly to the west. We will attempt to locate the population again another time. Hopefully, we just missed finding it and the population is still around. If you have a good idea where it is located let us know. 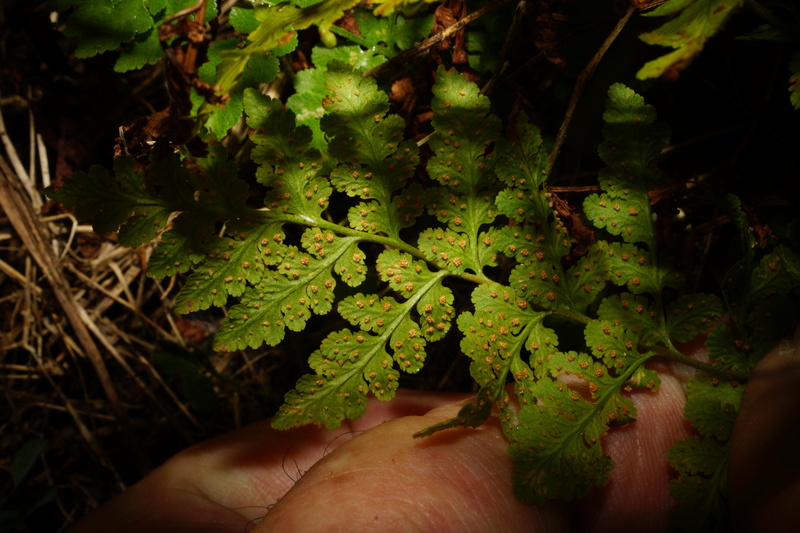 Juvenile Cliff Brake Fern plants with some small Ebony Spleenwort. On the cliff face, we spotted some presumed fern gametophytes and several fall blooming species in the family. It looks like an interesting site to return to in other seasons. Lock house at Dam 5 with retaining wall at base. 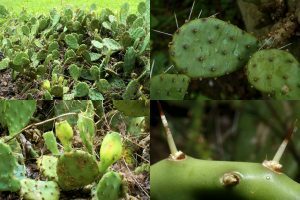 We continued our foray to the Dam 5 area of the C & O Canal where there was a reported population of Opuntia humifusa s.s.This time we were successful. The cactus was located at the base of a retaining wall below a lock house. Based on the small size and location of the cactus population, we concluded that it was probably planted and not naturally occurring. If you know of any other cactus populations in Washington County we would be interested in learning about them. 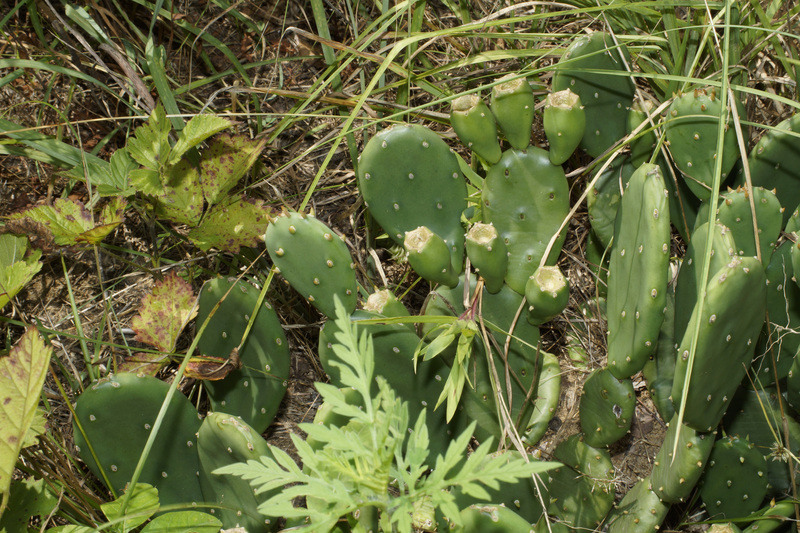 There are some cactus populations in Allegany County which we will be trying to re-locate, probably next spring. If you think you might like to participate, there is plenty of time to plan a foray. 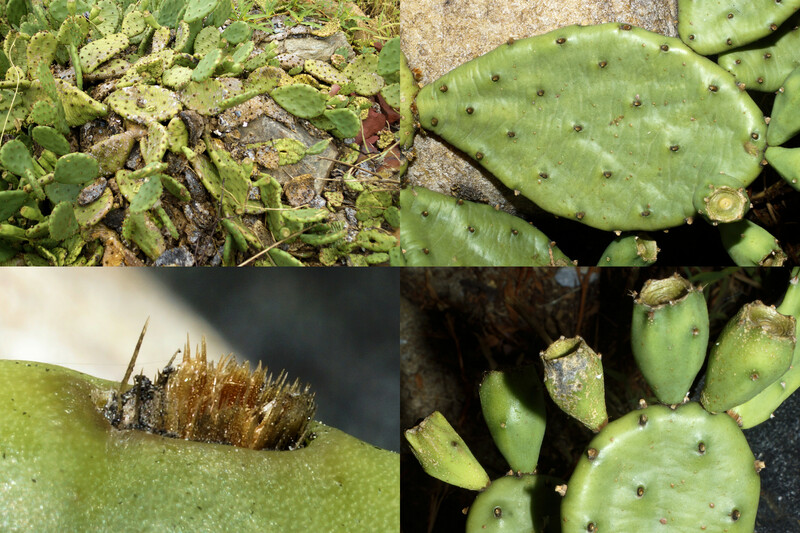 Here are some photos of other plants we saw while looking for the cactus. Had an awesome time with Rangers Matt Grey and Chris Winton of Anne Arundel County Park and Recreation this afternoon scouting out the cactus at Weinberg Park in Pasadena. 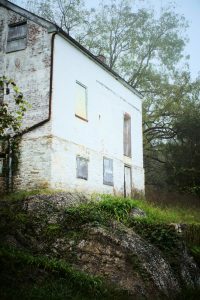 The site was near an old homestead. We could see two stone columns which could have come from a gate entrance. I understand that there is other evidence of a homestead at the site. 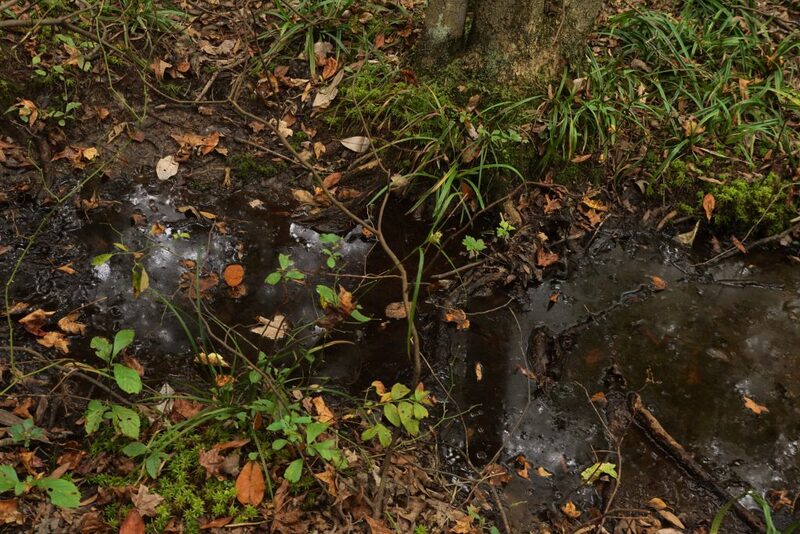 The site showed definite signs of anthropogenic disturbance likely from the folks who previously lived here. The soil was well-drained sand on a bluff above the bay. 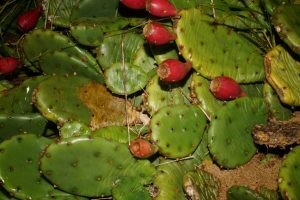 There is a high probability the cactus was planted and they were growing in an area about 15 feet by 15 feet. 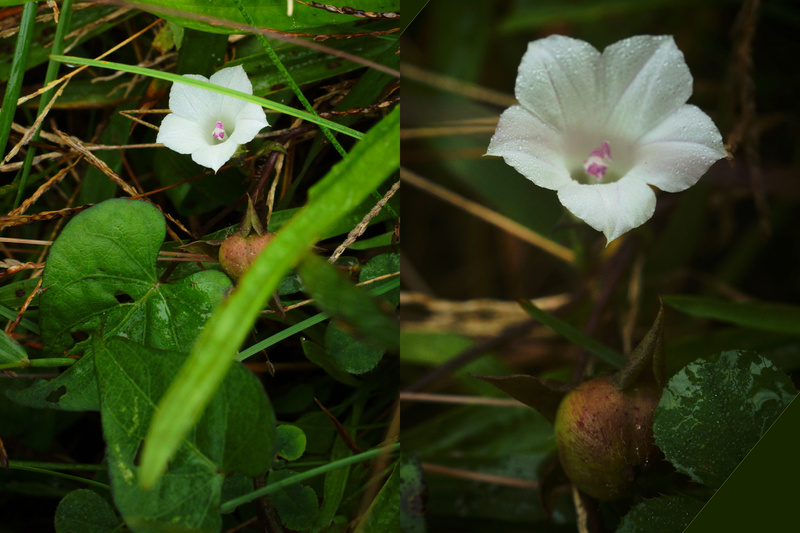 There were outlying scattered plants in the area as well. We also spotted some Yucca flaccida (weak-leaf yucca) which was planted nearby. 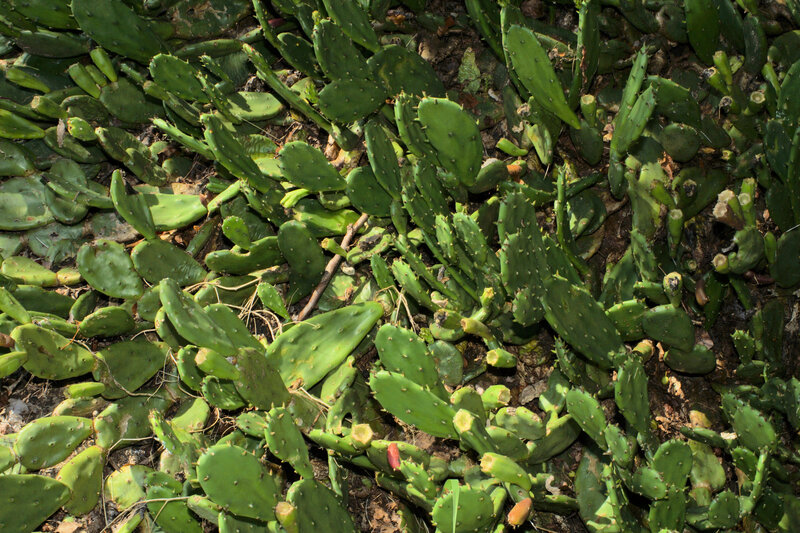 This, when combined with the planting of cactus, suggests that someone wanted to create a desert-like appearance at this site. The morphology of the plants conform with a determination of Opuntia humifusa s.s. We did not find spines on any of the plants and there were mostly 4 to 5 (6) areoles per diagonal row on the cladodes. 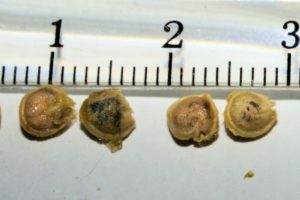 The seeds were 4.0 to 4.8 mm long. We plan to re-visit the site in the spring to note the flower coloration. Click here for collection data details. Had an awesome time today with Michael Ellis, park ranger and invasive plant specialist for the Maryland-National Capital Park and Planning Commission, Parks and Recreation. 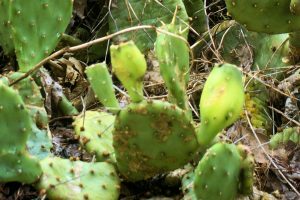 We visited two sites where prickly pear was growing. FIRST SITE – The first site was an open meadow near the Queen Anne Canoe Launch Patuxent River Park. The meadow was a restoration project and had an old field look about it. 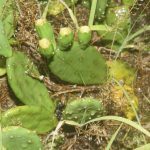 Based on the fact that the cladodes had no spines and mostly four or five areoles per diagonal row, these plants appear to be Opuntia humifusa s.s. We will be returning in the spring to look for flowers in bloom. 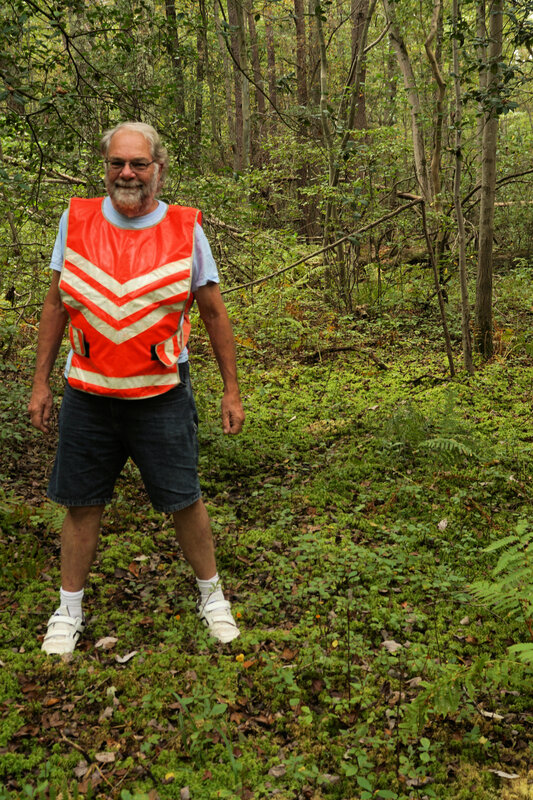 SECOND SITE – The second site was an old driveway off of US Route 301 in Bowie. The woods were overgrowing the driveway which was apparently no longer in use. We saw a few plants on the left side of the driveway, which we assumed to be planted by past owners. Many thanks to Michael for taking time out of his job to show me around. 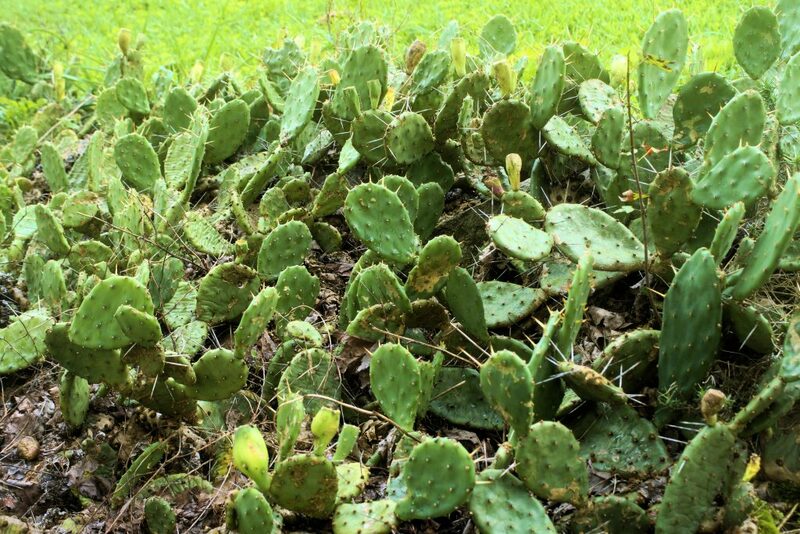 On the way home from Glen Arm, Maryland this morning, I stopped off at a location here in Elkridge where someone planted some prickly pear cactus evidently many years ago next to a parking lot. 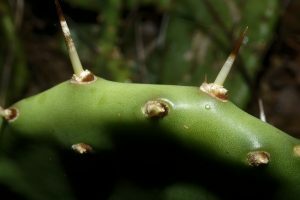 The plants key out to Opuntia humifusa sensu stricto. 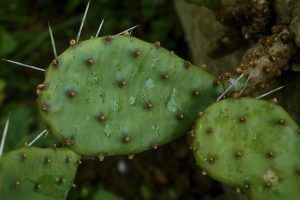 This morning I attempted re-visit a site where Clyde Reed collected some cactus in 1981 which has been determined by Opuntia expert Lucas Majure to be Opuntia cespitosa. 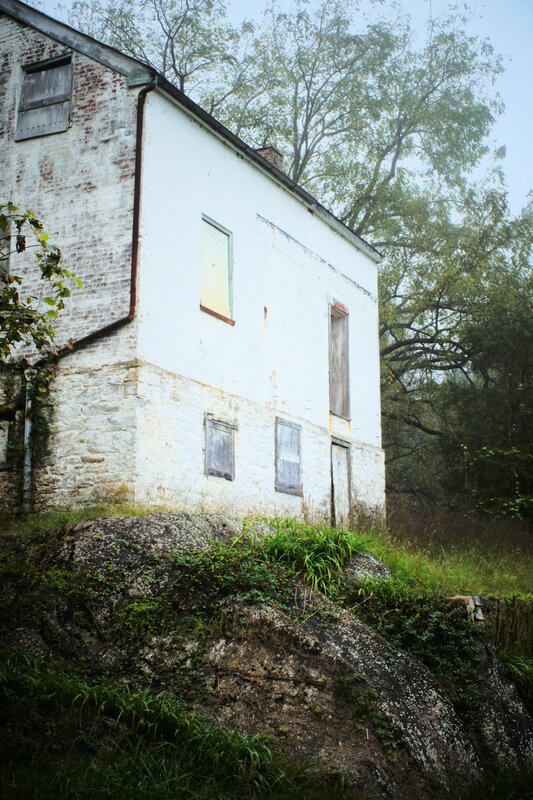 The site was on Factory Road in Glen Arm, Maryland (Click here for Reed’s record.). The voucher label described the site as an stone outcrop. Although I am not absolutely certain that I found the population from which Reed obtained his voucher specimen, it could be. The cactus I spotted was growing along a stone retaining wall. 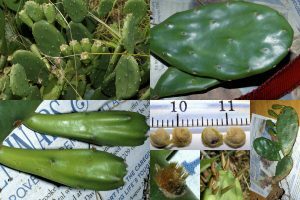 The morphology of these plants seems to conform with Opuntia cespitosa. 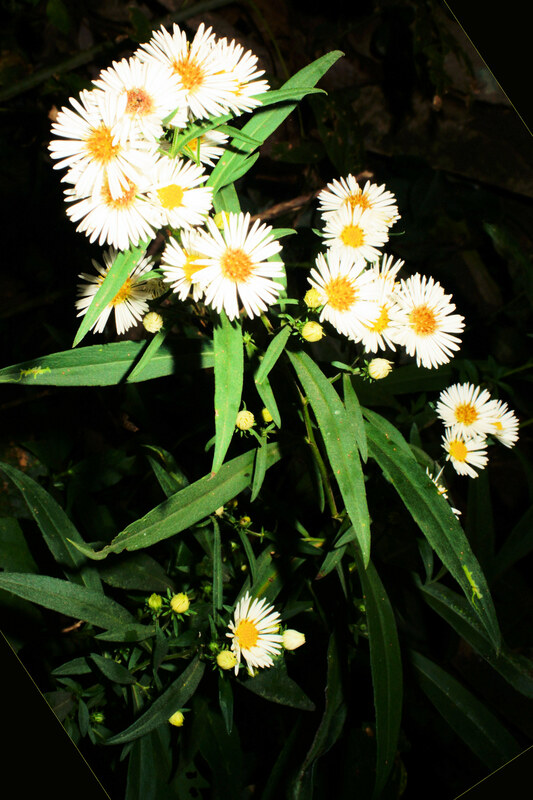 I talked with the landowner Ken, and he told that his wife planted them many years ago. 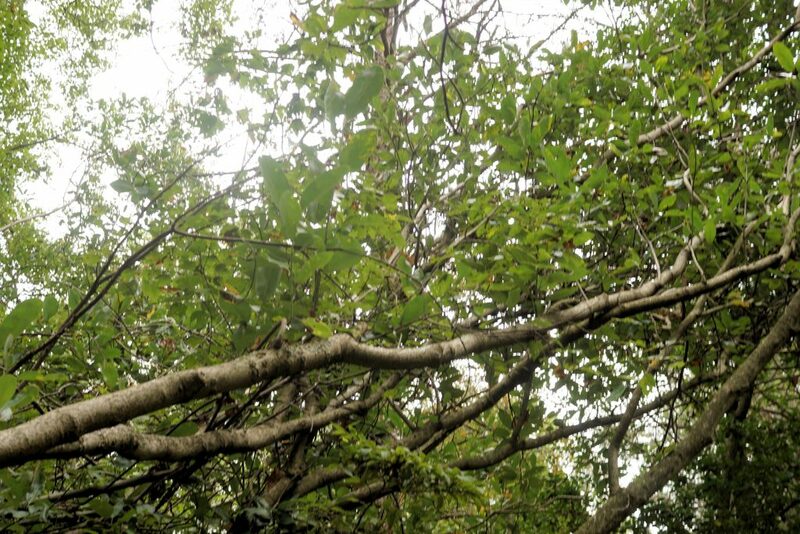 He believed that the original stock for the plants may have come from the nearby woods, but he was not certain. 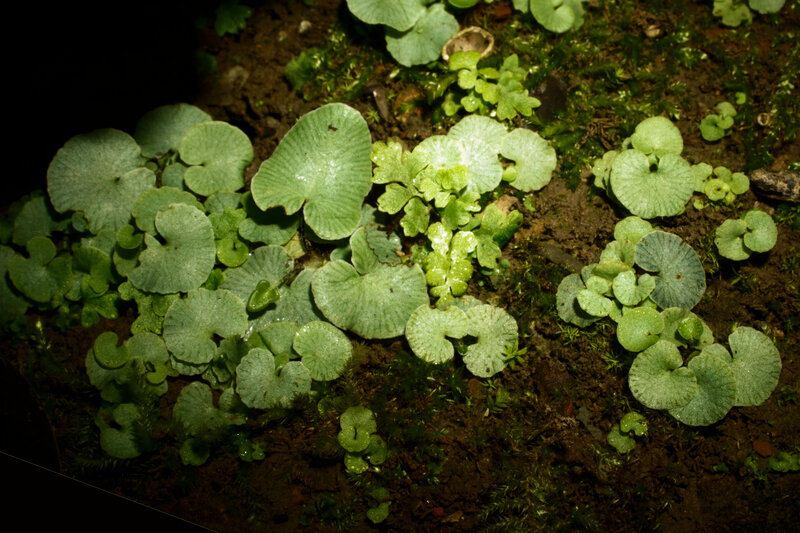 So, the plants I spotted should be considered to be cultivated. 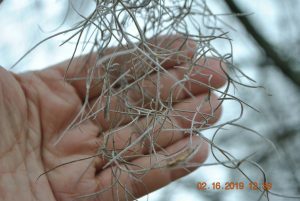 But the question of whether or not this species is native to Maryland is still unclear because we do not know if Reed collected his voucher from the cultivated plants I spotted this morning or if he collected his voucher from naturally occurring plants which may have been growing in the nearby woods. 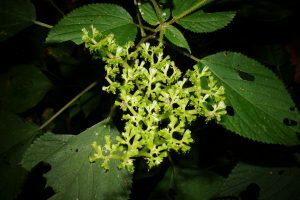 Another re-visit to this site is planned for next May or June to look at the coloration of the flowers and to obtain more information about the possible native occurrence of this species in the nearby woods. Today, Matt Beziat, Dave Anderson, and I paid a visit to the meadow next to the Jug Bay Wetland Sanctuary Center parking lot to look for the cactus reportedly there. 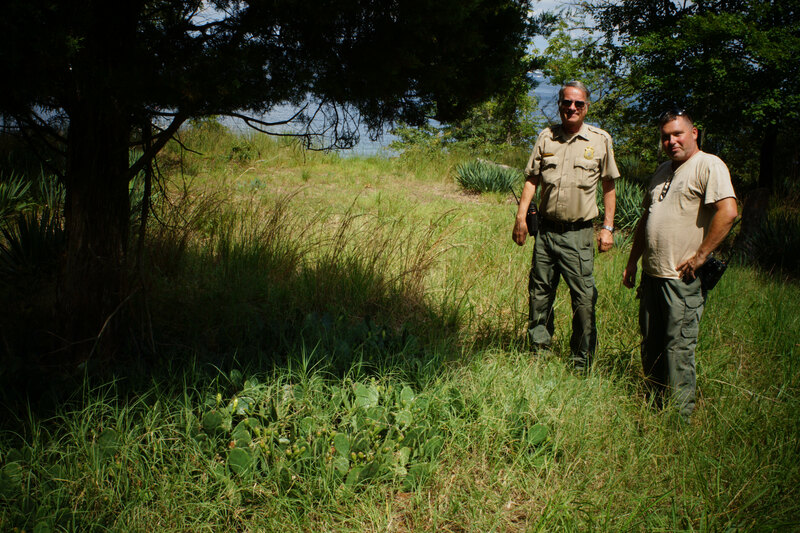 The meadow was well maintained with plenty of native plants. While walking around the meadow, we met up with Kerry Wixted who also happened to be in the area. 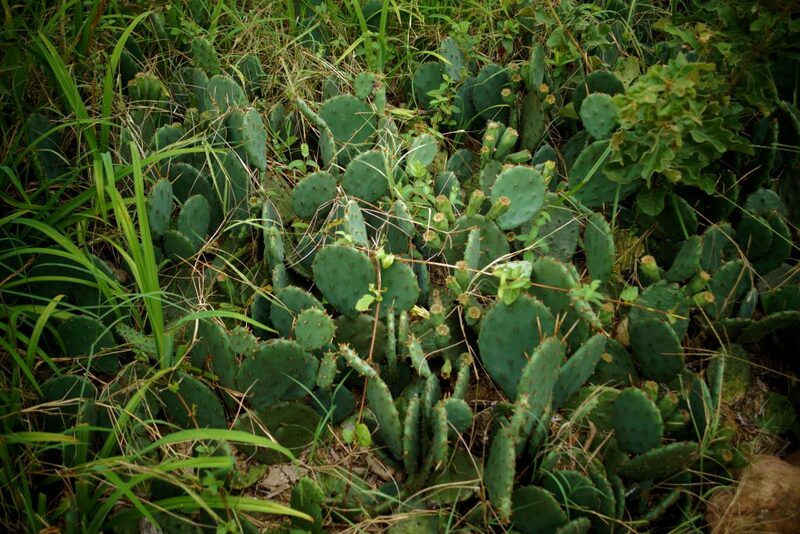 We spotted some cactus around the perimeter of the meadow on the opposite side of the parking lot. 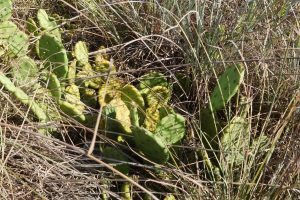 Someone had also planted some cactus along a fence across the road from the meadow. The cactus was apparently O. humifusa s.s. Most of the cladodes had four areoles per diagonal row with a few which had three or five. 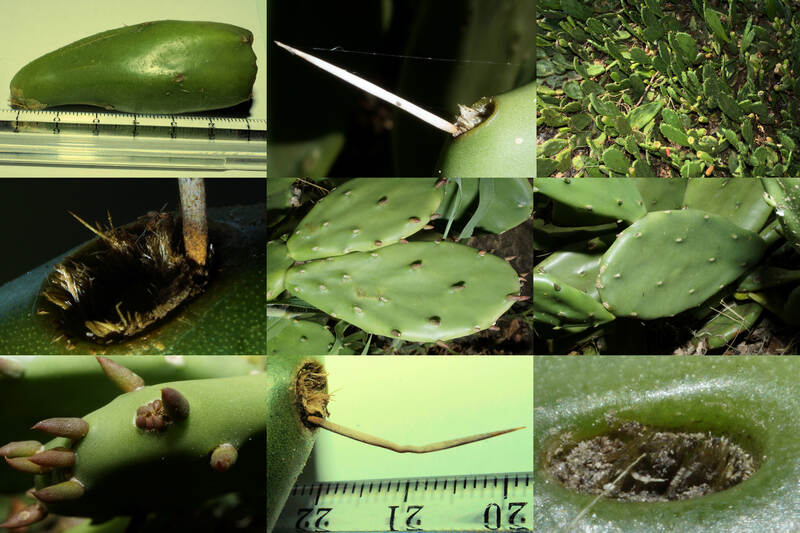 We did not see any plants with spines. 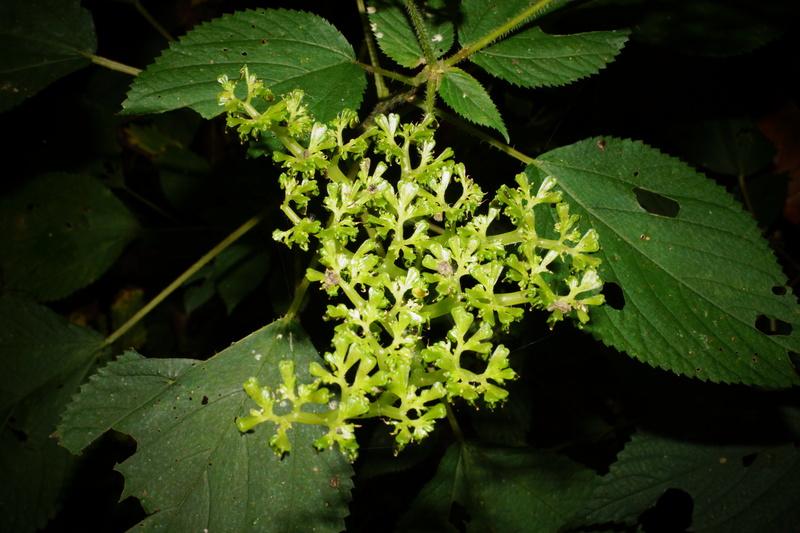 A spring visit is planned to examine the coloration of the flowers. 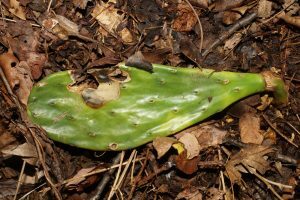 Today Sam Droege showed me a location where some Opuntia was growing along the east side of the Patuxent River along Sands Road in Davidsonville, MD in Anne Arundel County. There were scattered patches of cactus growing along the access road at the site, but the bonanza was about ⅓ of a mile from where we parked the car on Sands Road. 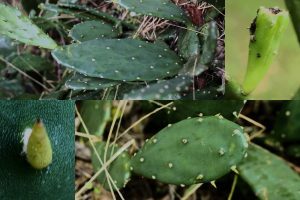 Cactus was all over the place. We did not have an accurate way to measure the area, but estimated the cactus covered at least 5 or 6 acres. 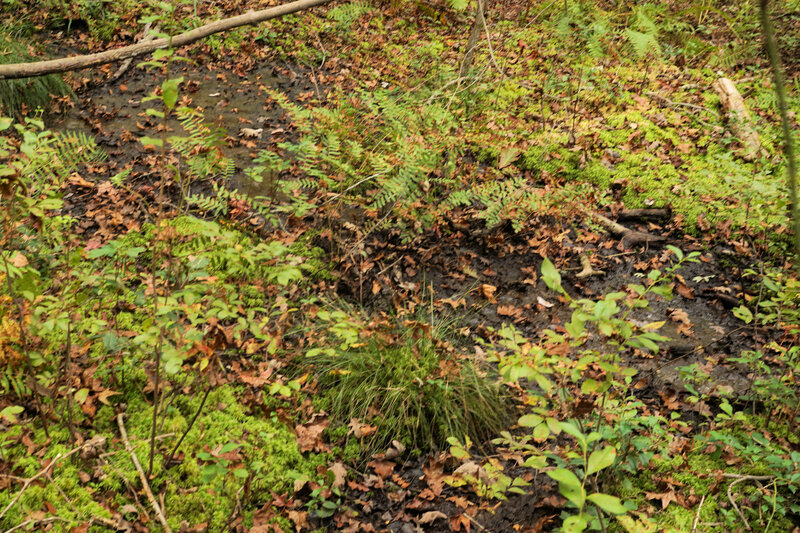 The habitat was an old field type in clearings with sandy soil. The area was an old sand borrow pit with evidence of sand having been moved around around in the past. The plants seem to key out to Opuntia mesacantha because the cladodes were spineless and there were three or four (not five) areoles per diagonal row. Closer examination of the plants in this population is needed and a trip to investigate the flowers is planned for next spring. 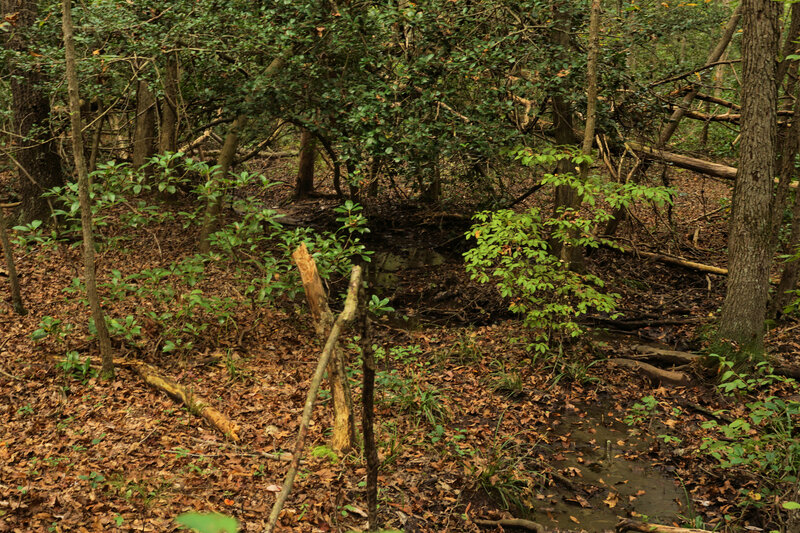 Dave Anderson and I spent some time this afternoon locating a previously undocumented Magnolia seepage bog that was recently discovered by the Patuxent Research Refuge supervisory wildlife biologist Sandy Spencer and biologist John Bourne on the Refuge’s North Tract. This is a fine example of the numerous seepage bogs found on the refuge. Today, I went out to the southern border of the Refuge to checkout the area around the old USDA Beltsville Landing Strip. 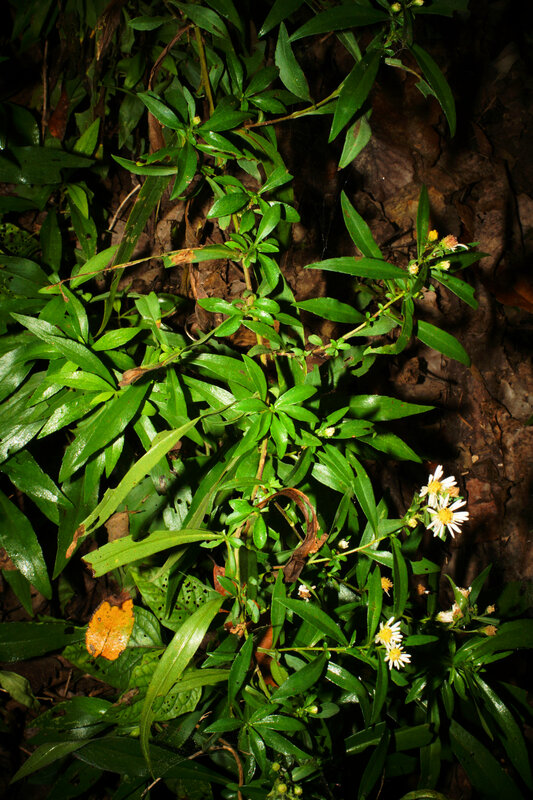 There were several species of weeds hanging around. 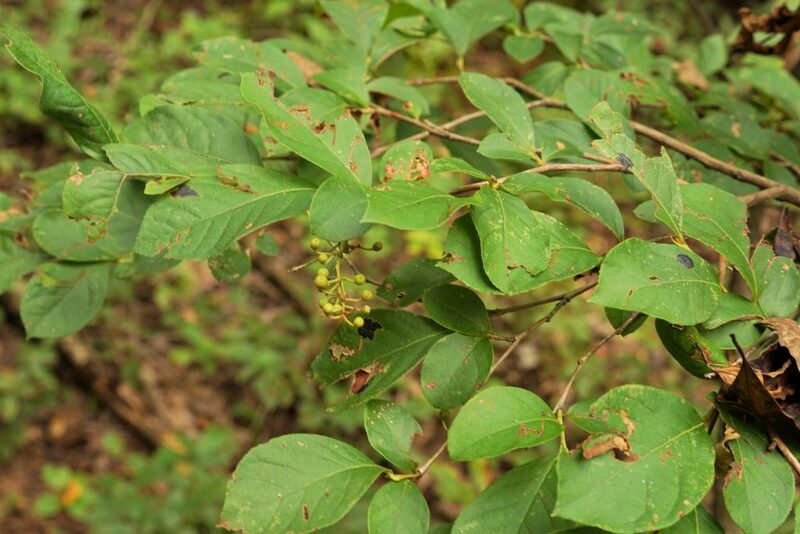 To my surprise, one of them ended up being a plant species that had not been documented for Maryland. 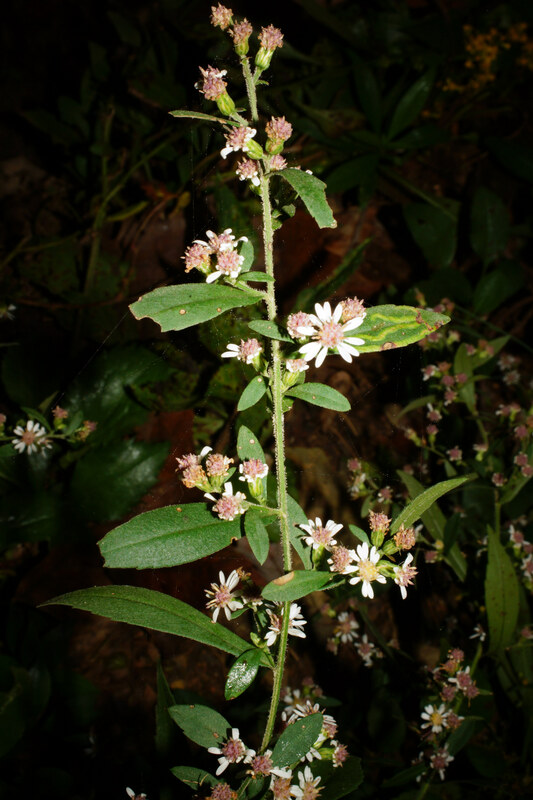 It is called Krigia cespitosa (Raf.) K.L. Chambers or Weedy Dwarf Dandelion. 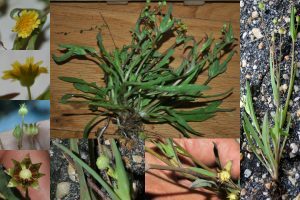 The Weedy Dwarf Dandelion is found throughout Southeast USA, including the neighboring states of Virginia and West Virginia, so its appearance in Maryland is not surprising. Since this plant was located at an airport historically associated with the USDA, it is very possible that it could have been introduced by an aircraft from another area. It would not be surprising if other as-of-yet-not-known species are at this site which were introduced by the same method. 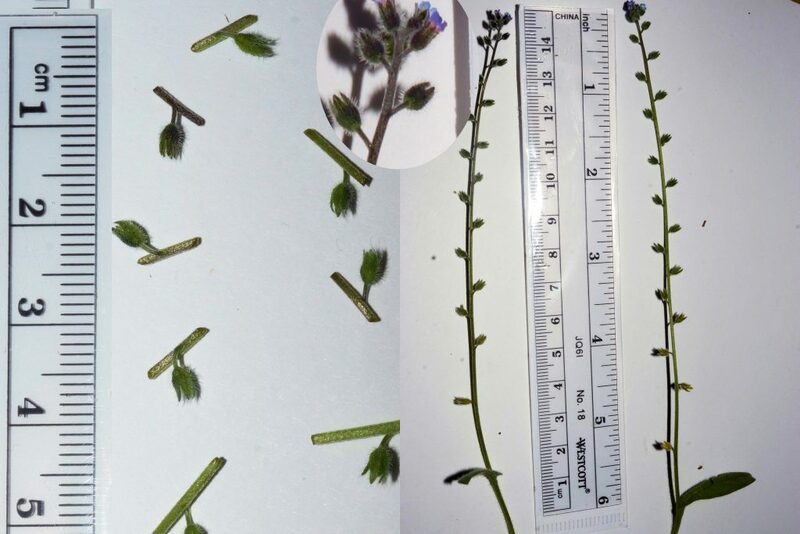 Another plant species new to Maryland, Lythrum hyssopifolia L. or Hyssop Loosestrife, was found near this location in June 2015. 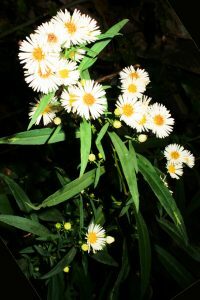 There are three other species from the genus Krigia in Maryland – K. biflora, K. dandelion, and K. virginica. 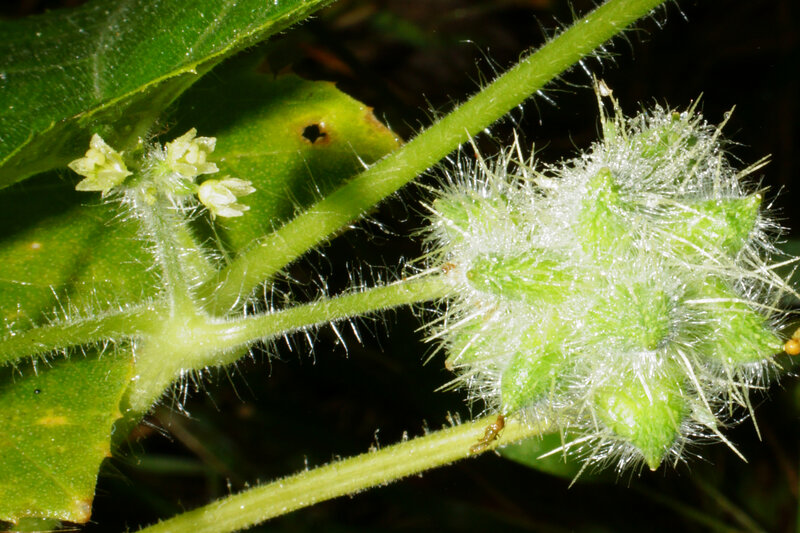 The lack of pappus in the flowering head is one of the traits which distinguishes K. cespitosa from the other three. My original determination of this plant species has been verified by Rod Simmons and Wes Knapp. 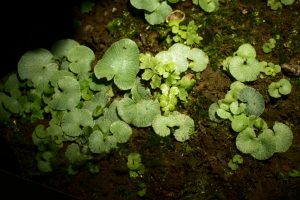 After looking at the key, we narrowed the possibilities down to three species – Myosotis arvensis, Myosotis discolor, and Myosotis stricta, the last three species on the key. So today I went out to the station where we first found the plant. 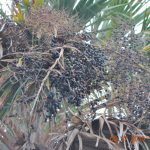 Of course, the flowering stems had elongated and there were more fruits. 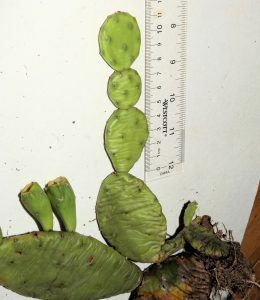 The fruiting pedicels were all shorter than the calyces. 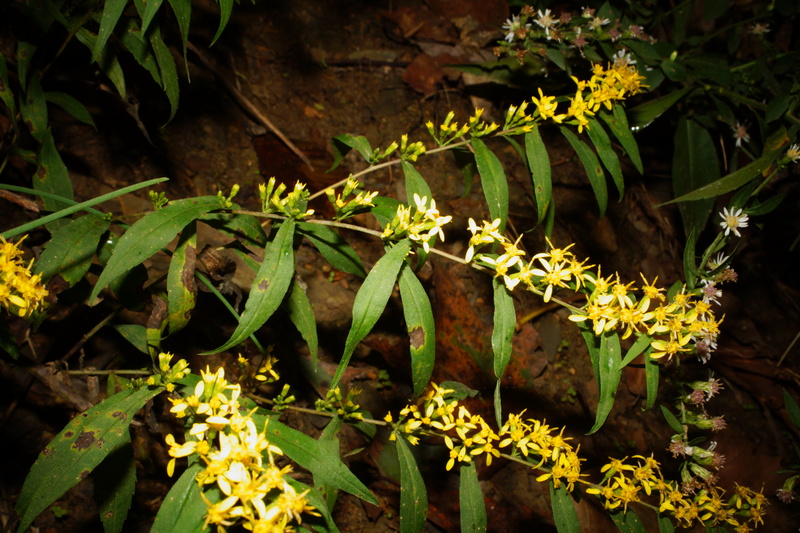 The plants were floriferous (with flowers) well below the middle of the flowering stems. I did not see any styles extending beyond the mericarps. 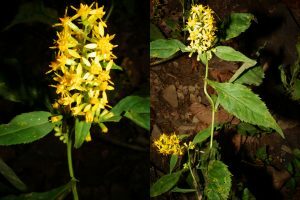 After running this through the key in the first blog entry, we come up with Myosotis stricta Link ex Roem. & Schult. or Strict Forget-me-not. 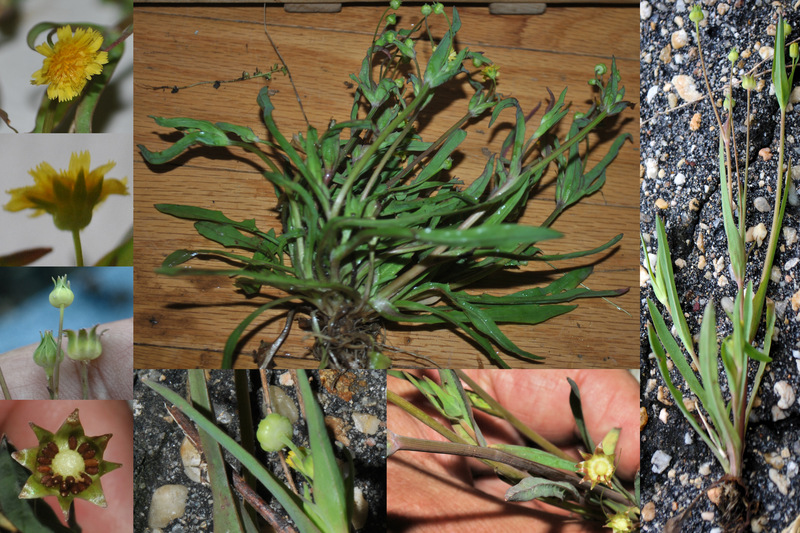 CONCLUSION: sometimes you have to look at a plant at different stages to be sure of an identification. This time we diverge from looking at plants. 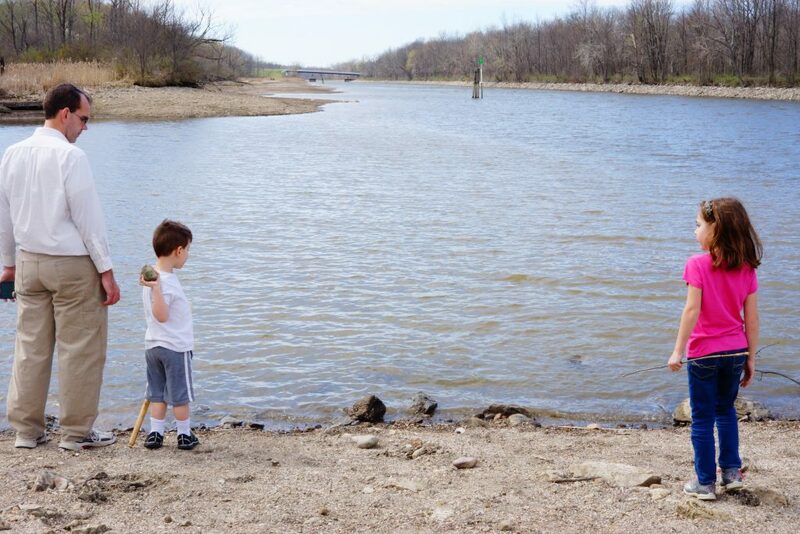 On our hike on the Butterfly Trail at Lock # 30, Erie Canal, Macedon, New York, we found at least four mollusks. In the first picture, you can see the “beach” where we found them. It was mostly made up of the remains of shells. 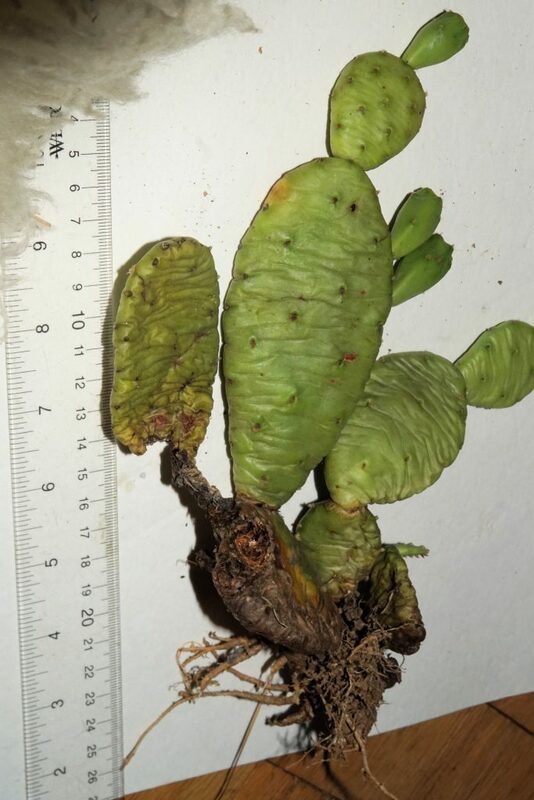 We would like to know what are the exact species. 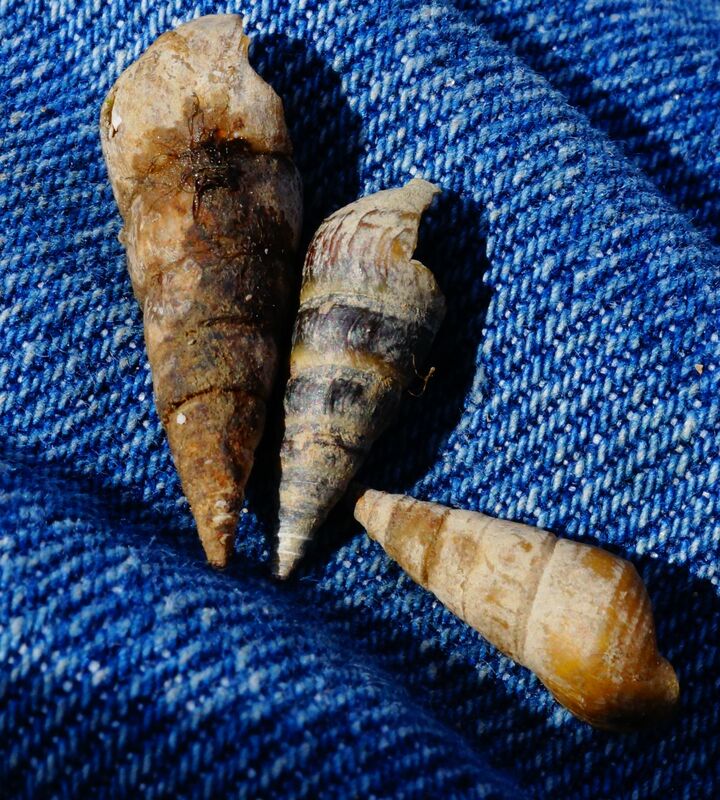 If you know or can verify the exact species of these mollusks please let us know. 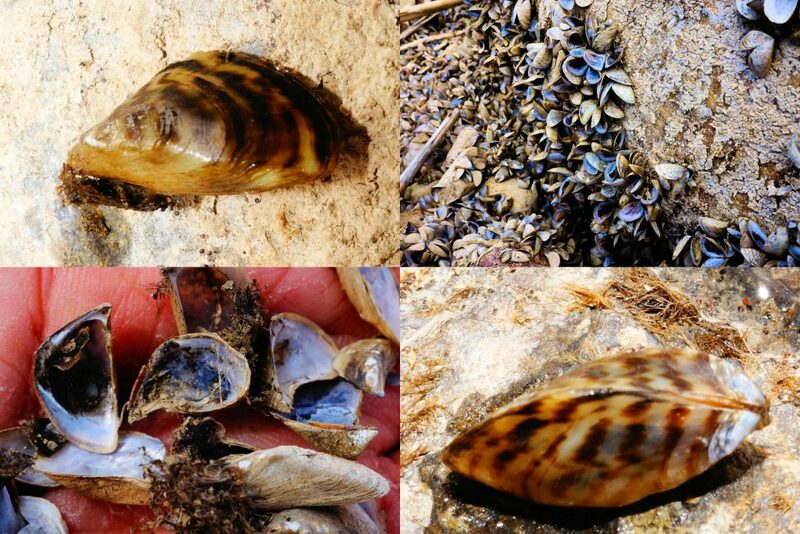 The first shells that we are looking at are Zebra Mussels (Dreissena polymorpha). 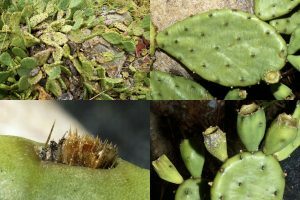 They are an aggressive invasive species throughout a large portion of North America. They were first detected inNorth America in the Detroit-Windsor area in 1988. They are considered a serious pest. 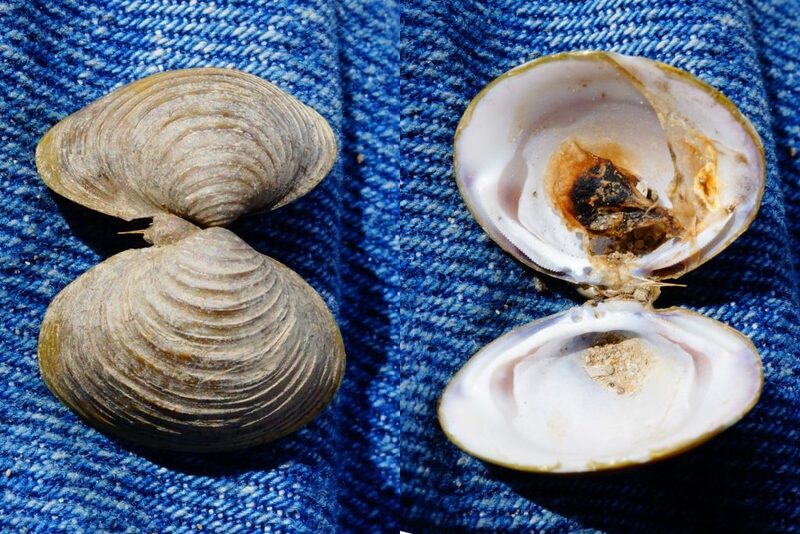 This one is believed to be the bivalve mollusk called the Asian Clam (Corbicula fluminea). I have no idea what this is. 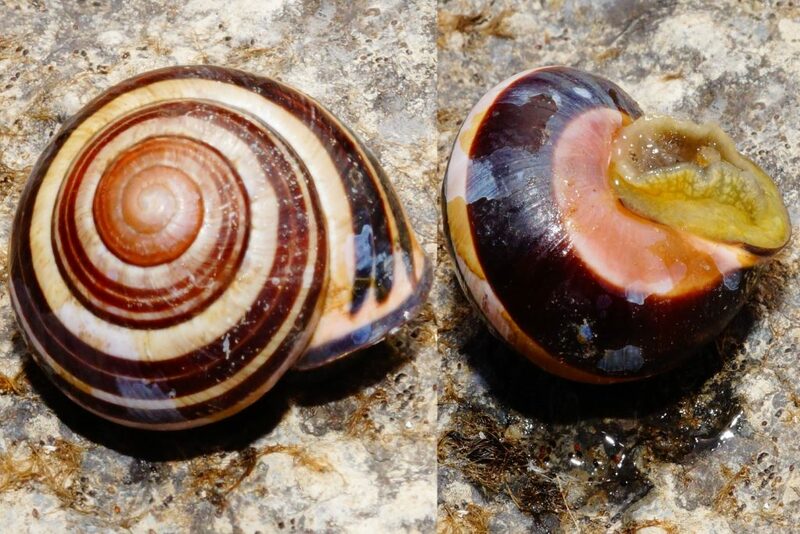 For this article I am calling it a Striped Snail. This little guy was alive when we found it. I am calling this one a Cone Snail. They are similar to some snails that we used raised in aquariums when I was younger. 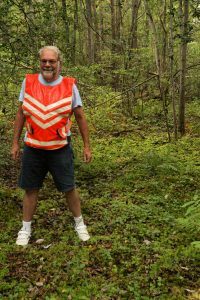 Today, I went on a botanical foray in Oldtown Elkridge concentrating on the area around the Thomas Viaduct and found several interesting exotics and even a few natives. Pictured here is the Poet’s Daffodil – Narcissus poeticus L. It is native to south and central Europe and had become naturalized in other parts of the world including Maryland. At this location, there were several dozen plants. Its short yellow reddish rimmed corona is a distinctive characteristic of this species. 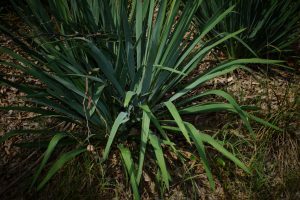 The origin of the name Poet’s Narcissus is not clear, but one version states that the poet Virgil wrote about a Narcissus which matched the description of this plant in his fifth Eclogue. 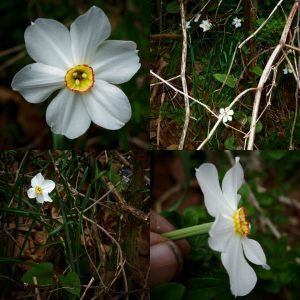 Theosphratus (371 – c. 287 BCE), in his botanical writings wrote about a spring blooming narcissus which subsequent writers consider to be this species. Bourne, Stephen Eugene; W. L. Foster (1903). The Book of the Daffodil. J. Lane. p. 3.